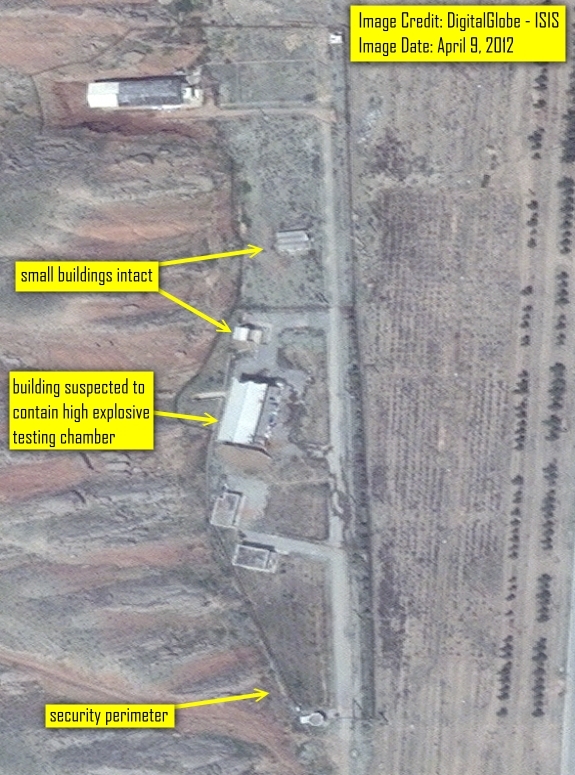 The latest commercial satellite imagery from the alleged Parchin high explosive test site in Iran shows a steady pace of what appears to be the “reconstruction” phase of the site which between April and July 2012 had undergone considerable alterations. Such alterations included building demolitions and earth displacement. Figures 1 through 4 provide a reverse timeline of imagery starting from the latest changes to before major alterations began in late spring 2012. 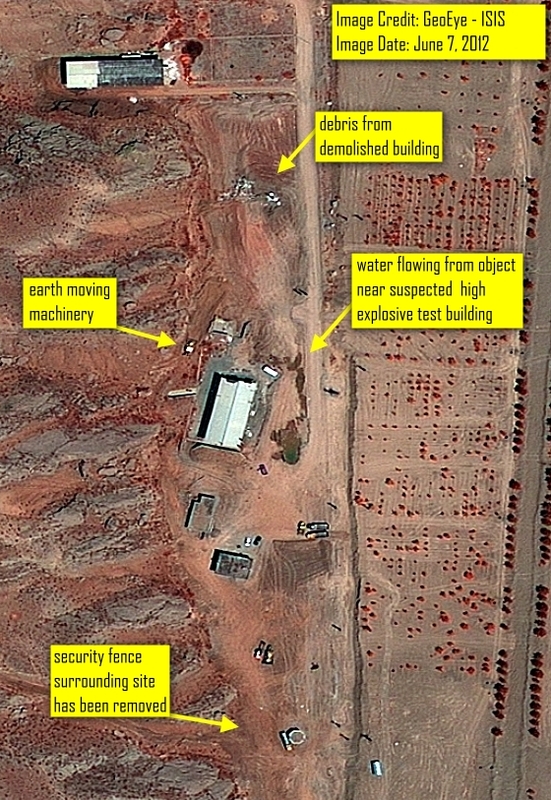 The latest imagery from December 9, 2012 shows what appears to be a new, almost completed security perimeter around the site (figure 1). In the previous imagery from November 7 (figure 2), ISIS had identified the construction of a cement terrace or wall that has now become part of the western side of the new security perimeter which resembles the predecessor fence that was demolished in late spring of 2012 (figure 4). Notable are further changes to the two major buildings at the site which appear to have been covered with white or gray roofing. Previously the roofing had been covered with blue paint or completely new roofing had been installed (figure 2). Additionally, a section of unknown material that seemed attached to the entrance of the suspected explosive chamber building in the November 7, 2012 imagery is no longer present in the latest image. A new site layout is taking shape and the presence of dirt piles and a considerable number of earth moving vehicles and cars suggest that construction is continuing at a steady pace. It is not clear when or if IAEA inspectors will be granted access to the site. 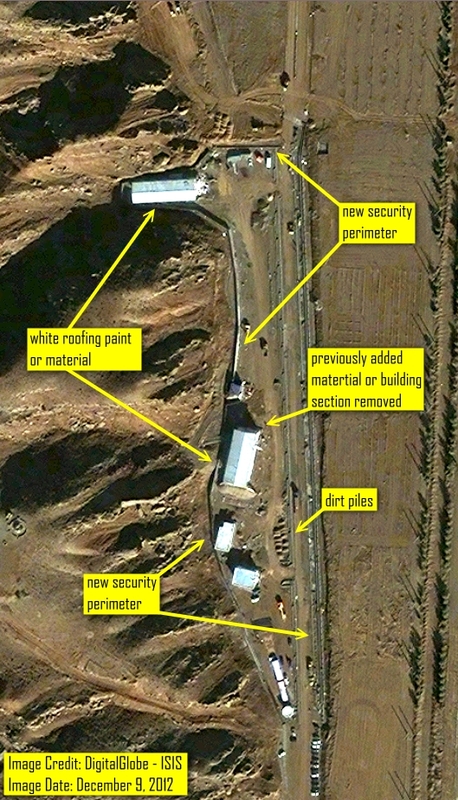 The IAEA has stated that in light of these continuing activities at Parchin, “When the Agency gains access to the location, its ability to conduct effective verification will have been seriously undermined.” 1 It nonetheless reiterates its “request that Iran, without further delay, provide both access to that location and substantive answers to the Agency’s detailed questions regarding the Parchin site and the foreign expert” (identified by ISIS as former Soviet scientist V.V. Danilenko). For a discussion of the IAEA’s mandate to inspect the Parchin site see Understanding the IAEA’s Mandate in Iran: Avoiding Misinterpretations, a collaborative report written by David Albright, Olli Heinonen, and Orde Kittrie and endorsed by John Carlson, Trevor Findley, Pierre Goldschmidt, and Andreas Persbo. 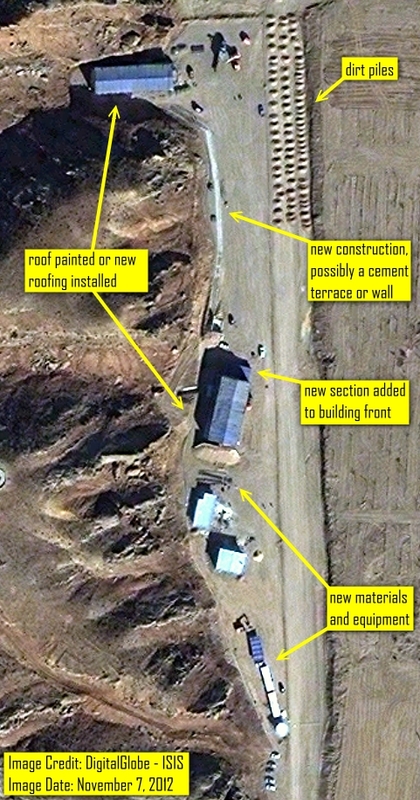 Figure 1: Commercial satellite imagery from December 9, 2012 showing ongoing construction, a new security perimeter, and new roofing on the two major buildings at the site. Figure 2: Imagery from November 7, 2012 showing blue roofing covering the two major buildings. An unidentifiable section attached to the front of the suspected chamber building is visible. Rows of earth piles have been collected most likely to be used in paving and construction at the site grounds. Figure 3: Imagery from June 7, 2012 shows the Parchin site at the height of the demolition and earth displacement process. The debris from the demolished buildings is visible at the site, the security perimeter has been removed, and there are heavy signs of earth displacement activity. Figure 4: Satellite imagery of the Parchin site from April 9, 2012, taken before the beginning of major alterations undergone by the site starting in late spring of 2012. The original security perimeter and driveways to the various buildings are clearly visible as are the two small buildings that were later demolished. 1 Implementation of the NPT Safeguards Agreement and relevant provisions of Security Council resolutions in the Islamic Republic of Iran, November 16, 2012, section H, subsection 45.